Let me first say that this psychological thriller definitely gets the heart racing, but it is rather disturbing, so if you are a bit sensitive to violence and/or disturbing content, I wouldn't recommend it for you. The main character is Paige Dawson, a woman in her 40's, whose daughter was murdered ten years ago, and whose husband has recently committed suicide. Paige, when we are first introduced to her, is almost beyond help. She gets through her days by popping pills and consuming a lot of alcohol, trying to block out the reality that is her life. The lengths she goes to in order to drown out her grief are quite shocking. I really felt for her. Then Paige starts to notice things happening in her home, and she makes the effort to control the substance abuse in order to find out whether she is just imagining things, or whether something more sinister is occurring. We are then hit with a HUGE twist that you would never suspect. And I must be honest and say that I am not sure that I really liked where the book went from there. Don't get me wrong, it definitely kept me turning the pages, but the story takes such a dark turn that it almost made me want to stop reading. The book is set out in three parts; and the first was by far my favourite part, the latter parts felt somewhat rushed. It's a shame because the story had the potential to be brilliant. The book would've benefited from at least another 50 pages, just to develop the storyline further, as well as the characters. I needed to know more, and it all just felt as though it sped through too quickly, leaving questions unanswered. Overall, if you're after a quick thriller, and don't mind being taken on a rather creepy, very dark trip, then this is the book for you! I'd be interested to hear from anyone who reads this book after reading my review. I plan to read Jack Jordan's other book, Anything For Her, just to see how his writing style varies. 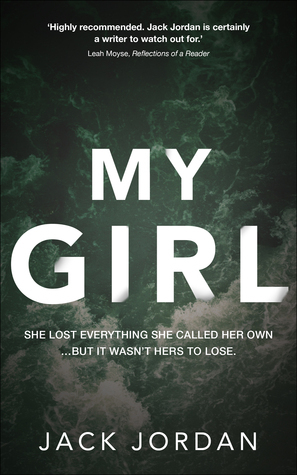 I was gifted a copy of My Girl through netgalley in exchange for an honest review. Janet, I've just blogged about another psychological thriller - and this one might just be one you'd like to read..